Good news for Mexico’s “little sea cow”, the world’s smallest porpoise, known in Spanish as the vaquita marina, currently the most endangered cetacean in the world. The federal government has approved a compensation plan designed to protect the vaquita marina, with a budget of 69 million dollars, spread over two years. 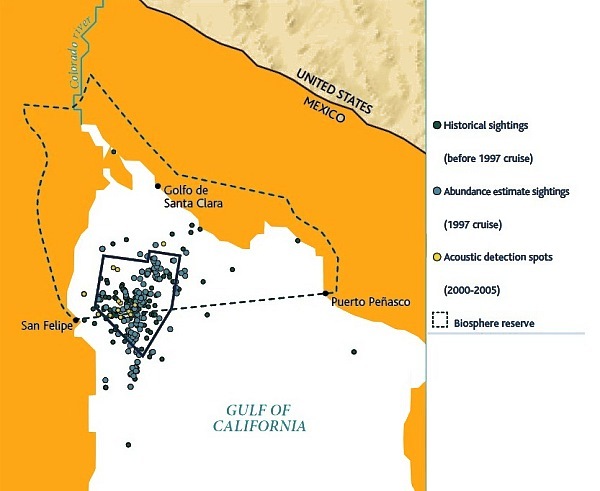 Most of the funds will be used to pay 1,300 fishermen in San Felipe and Santa Clara in the upper Sea of Cortés (Gulf of California) not to fish. There are thought to be fewer than 100 vaquitas remaining in the wild. Banning fishing in the main area where the little sea cows are found will eliminate the loss of further vaquitas as bycatch. Besides paying compensation to fishermen in return for not fishing, some funds will be allocated to finance annual inspections and introduce surveillance drones to ensure compliance with the conservation plan and detect any illegal fishing. The unmanned drones will be managed by Mexico’s Environmental Protection Agency (Profepa). Some funds will also go to research, with an emphasis on trying to develop a vaquita-safe shrimp net that can safely be used in the area. Banning fishing for the 860 holders of fishing licenses in Santa Clara and the 494 licensed fishermen in San Felipe, may help the vaquita marina, but will bring some adverse consequences to the local economy since there no compensation is on offer for those workers, including many women, who are involved in fish processing and other parts of the production chain. As Luis Fueyo, the head of Mexico’s National Protected Areas Commission (Conanp) has said in recent press interviews, the vaquita marina cannot possibly recover in two years because they only reproduce every two years and only 25 of those remaining are of reproducing age. Fueyo says that the plan needs to look ahead 20 to 30 years in order to create a viable population of 5,000 vaquita. So, while a two year ban is nowhere near long enough to achieve any measurable increase in the vaquita marina population, it is a good first step in the right direction. Hopefully, the federal government will allocate additional funding in future years to ensure that the world does not lose this critically endangered porpoise.